The Vizsla thrives as part of an active family that provides daily exercise. Vizslas are extremely loving and demonstrably affectionate family dogs who thrive in the hub of family activity. Vizslas are very active, curious, intelligent and devoted family members. Consequently, they do not thrive when ousted to the back yard or kenneled or separated from their family for prolonged periods. For your vizsla to reach his or her full intellectual and emotional potential, he or she must be treated as a respected and valued member of your family and included in family activities. While a well-trained Vizsla is a loving, wonderful companion, it is not the breed for everyone. 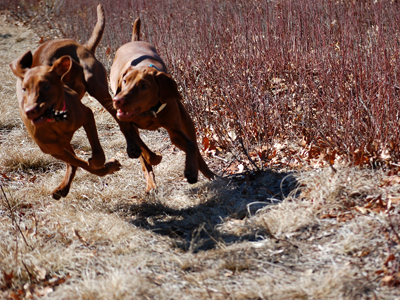 The Vizsla requires lots of exercise, preferably at least one hour off leash every day. It is a fun-loving and curious breed, however, when left alone for extended periods of time can become bored and destructive. 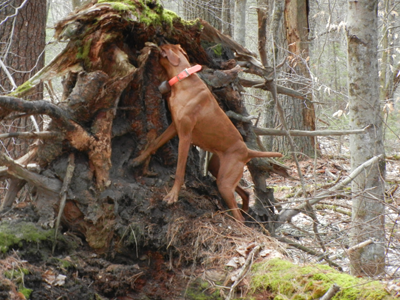 The Vizsla is an intelligent, sensitive, and highly trainable dog, and responds best to positive training techniques. The Vizsla is an extremely affectionate dog and should be treated as part of the family, they do not do well as kennel dogs or if left outside alone.